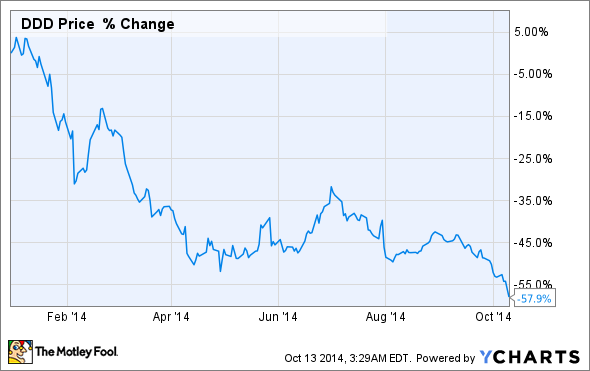 Is It Time to Buy 3D Systems Corporation's Stock? With shares off more than 55% year to date, does it pay to be contrarian? Although shares have cratered more than 55% year to date and pessimism surrounding 3D Systems' (NYSE:DDD) stock is hovering near its 52-week high, now may prove to be an opportune time to consider buying a small position in one of 3D printing's biggest names, with the intention of holding shares for the next three to five years. During this time frame, 3D Systems should be able to demonstrate the true earnings potential of its business model -- and hopefully reward shareholders in the process. Investors can think of 3D Systems as the Amazon.com of 3D printing, in the sense that it aims to become The Everything 3D Printing Store. Whether it is the consumer, professional, or industrial markets, the company wants to become the one-stop shop for all things 3D printing. 3D Systems' jack-of-all-trades approach is supported by seven distinct printing technologies, each of which is best suited for a host of different applications. Because the company has the most 3D printing technologies in its portfolio of any 3D printing company, it should be able to cater to the most applications, giving it the potential to generate the most revenue. In other words, 3D Systems arguably has the biggest market opportunity in its industry. Beyond 3D printing technologies, 3D Systems is eager to continue growing its market opportunity through a combination of acquisitions, research and development, and strategic partnerships. In the last three years, the company has made roughly 50 acquisitions aimed at bolstering its 3D printing technologies and expertise. The company has also more the doubled its R&D commitment in recent years to support its ever-growing product portfolio and efforts to drive new product innovation. Speaking of product innovation, 3D Systems' partnership with Google's Project Ara, a modular smartphone component concept, has led to creation of a new 3D-printing technology platform that could have game-changing implications for the industry by becoming a more viable option in larger-scale manufacturing runs. Going forward, 3D Systems aims to generate $1 billion in full-year sales in 2015, representing nearly 95% growth over its 2013 full-year revenue. To put this growth in perspective, the 3D-printing industry is expected to grow by more than 31% per year between 2013 and 2020, suggesting 3D Systems intends to increase its share of worldwide 3D printing revenue in the coming years. 3D Systems' aggressive pursuit of its market opportunity has come at the expense of short-term earnings -- to the point that the company has missed earnings expectations for the last two quarters. Undoubtedly, this has raised questions about whether 3D Systems' valuation remains priced beyond its future earnings potential. Conversely, management has highlighted on numerous earnings calls that it is more concerned with serving the best long-term interests of its business than its short-term operating results, especially if it means better business outcomes. Arguably, this longer-term focus has inflated 3D Systems' trailing P/E ratio in the short term, but that should begin to normalize once 3D Systems slows its rapid pace of investment. Come 2016, management expects the company's operating leverage will be "fully restored," meaning investors are likely to get a better sense of the company's true moneymaking abilities in the not-too-distant future. Assuming 3D Systems can deliver on its longer-term potential with consistent earnings growth, today's sky-high valuation could prove to be a bargain years from now. Because the 3D printing industry is expected to grow by more than 31% per year through 2020, it has attracted the attention of many businesses. I'm not talking about the obvious competitors like Stratasys, which poses a direct threat to 3D Systems' underlying business, but about deep-pocketed and slower-growing companies such as Hewlett-Packard that are seeking new avenues of growth and have virtually unlimited resources. In other words, because 3D Systems is entrenched in such a high-growth industry with historically lush profit margins, it is inviting all sorts of new competition. The more competition the company faces, the more challenging it could become for it to deliver on its promise of long-term earnings for shareholders. Increased competition could force 3D Systems to lower its prices and face profitability pressures -- or even disrupt its business with superior products and technologies. Additionally, 3D Systems' acquisition strategy could become an operational nightmare and its seven 3D-printing technologies could prove to be too burdensome an R&D expense, sapping earnings potential. Is 3D Systems a buy? When you buy stock in a fast-growing company like 3D Systems, it's really a vote of confidence that it will earn more money in the future. If you're considering buying shares of 3D Systems, ask yourself if you believe management will deliver on its promise of long-term earnings growth. While there is evidence that management remains on track to deliver on this promise and is executing its strategy well, there's no such thing as a guarantee in investing. Much can change in the next few years, especially in a rapidly growing and dynamic industry such as 3D printing. Prospective investors should be aware that there isn't a high margin of safety built into 3D Systems' valuation, should management fail to deliver. Personally, I believe management continues to put the long-term best interests of the business before anything else, a characteristic that aligns nicely with the interests of long-term investors. Also, I don't think the risks cited in this article are likely come to fruition for a number of years. As I monitor for any material changes to the long-term investment thesis, I'll keep my shares for as long as the underlying business fundamentals remain on track.